Diablo III's 2.1 patch is its biggest free update ever, adding a plethora of new game modes, items, class balances, and zones. 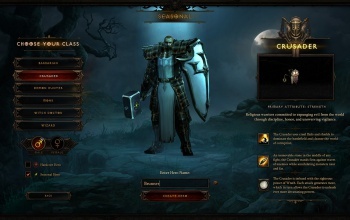 One thing that Diablo III fans have been asking Blizzard for since pretty much the game was released, was a variation of Diablo II's "ladder mode" - where players could create fresh, level 1 characters, and race to progress them as far as possible within a short amount of time. Tomorrow, those fans will finally get their wish, as the game's massive 2.1 patch will launch, bringing with it the "Seasons" game mode (which is essentially ladder mode) as well as a wealth of additional changes and additions. It is worth noting that Blizzard did state that while all the Seasons infrastructure will launch with 2.1, the first Season won't actually start until a few days later. Along with Seasons, the second major addition in 2.1 is "Greater Rifts". Unlike the regular Nephalem Rifts which were introduced in Reaper of Souls, greater rifts are a kind of "endless dungeon" that should give even the most dedicated Diablo players a substantial challenge. Each rift has a time limit, and if you manage to complete it within said limit, you'll get a key to an increasingly difficult higher level rift. The spoils of running Greater Rifts in lieu of regular Nephalem Rifts are legendary gems - powerful gems with unique affixes, that you can actually upgrade as you progress through each Greater Rift level. Two new zones: The Cesspools and The Vault (where you can finally fight the leader of those annoying treasure goblins: Greed), dozens of class balance changes, and plenty of minor quality of life improvements round out the game's biggest free update since launch. Check out the official Patch notes as well as this nice little roundup from Diablo Fans for more information. Its not known when (or if) all of these changes will make it to the console versions of the game. And before you ask, no, the always-online requirement has not been removed, and most likely never will.